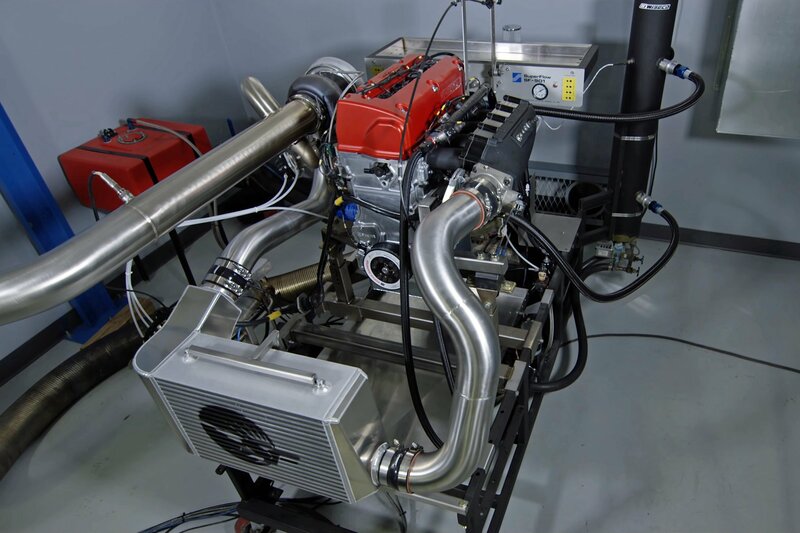 In their quest to stay on the cutting edge of LS-based performance, the guys at Late Model Engines have tried all manner of modifications to see the effect on an engine in real-time. As with any research and development effort, some of them have worked, and some of them haven’t – but the ones that are successful have made LME one of the premier shops to call if you’re looking to go fast with an LS engine. With hundreds of customers around the world running various combinations at the front of their respective race classes, it seems that the LME team has figured out a thing or two – so we went straight to the source to learn a thing or two that we can share with you, our loyal readers. In fact, we didn’t learn a thing or two; with the help of LME’s Bryan Neelen, we put together their top ten tips on building a solid LS race engine. 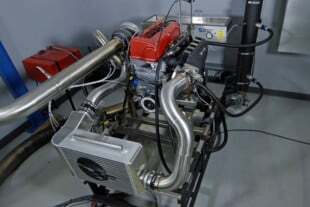 In the process of educating us, they put together a wicked 400 cubic inch beast using the best components they could find, as this engine was designed for competition use making well over 2,000 horsepower. Let’s get into the details, shall we? The completed LME 400 LSX longblock in all its glory. At the core of this particular engine is a standard-deck LSX block from none other than Chevrolet Performance, using a 4.125-inch final bore dimension. LME has invested hundreds of hours into the CNC programing for their block machining center, which handles nearly every task discussed in this article. One of Callies‘ finest billet 3.750-inch stroke crankshafts was laid into the LSX’s bottom end, and a set of GRP Aluminum Pro Series connecting rods measuring 6.000-inches long help to set the displacement. The connecting rod caps are retained using a set of ARP‘s L19 fasteners, which are required in an application like this for maximum durability. L19 is a proprietary material developed by ARP, and is a vacuum melted alloyed steel that uses chromium and carbon to achieve high hardness. L19 steel is the highest-strength rod bolt material offered by ARP. ARP fasteners are used in every critical location in this engine; the balancer bolt [PN 234-2503] retains the ATI harmonic damper. 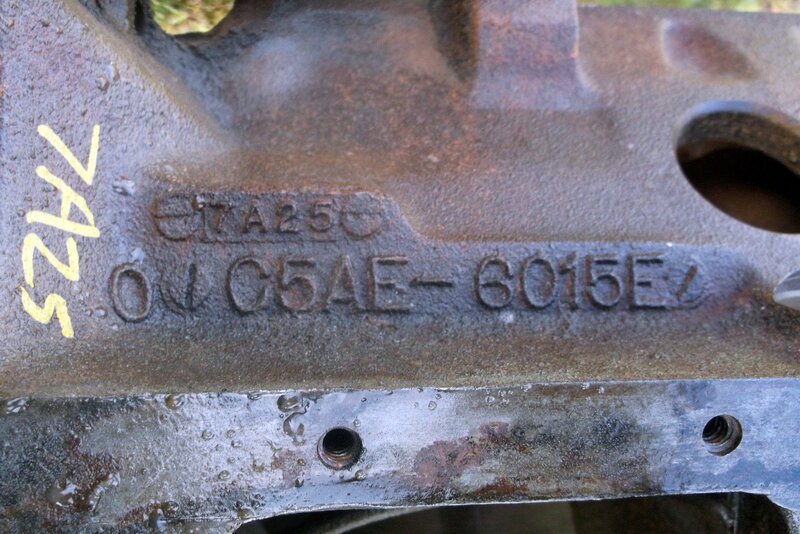 ARP’s 234-5608 main studs are also installed along with the aforementioned connecting rod bolts. ARP2000 material is used for the half-inch head studs, and each of the other fasteners used throughout the engine are also from ARP – they’ve proven themselves in our application as well as millions of others. A Callies billet crankshaft is used along with a set of GRP aluminum connecting rods and JE pistons. Each part has been spec'd for this particular engine and its capabilities. A complete set of MAHLE Clevite H-Series main [PN MS2199H] and connecting rod bearings [PN CB663HND] were installed; the main bearings are tri-metal design, use a steel backing, and have a high crush factor, critical with the use of a large supercharger. Most importantly, there are enlarged chamfers at the sides for greater crank-fillet clearance. These use a half-groove style for better oiling. Rod bearings use the same type of construction. The crankshaft uses a large journal 2.100-inch dimension for the connecting rod; the bearings are sized for such. 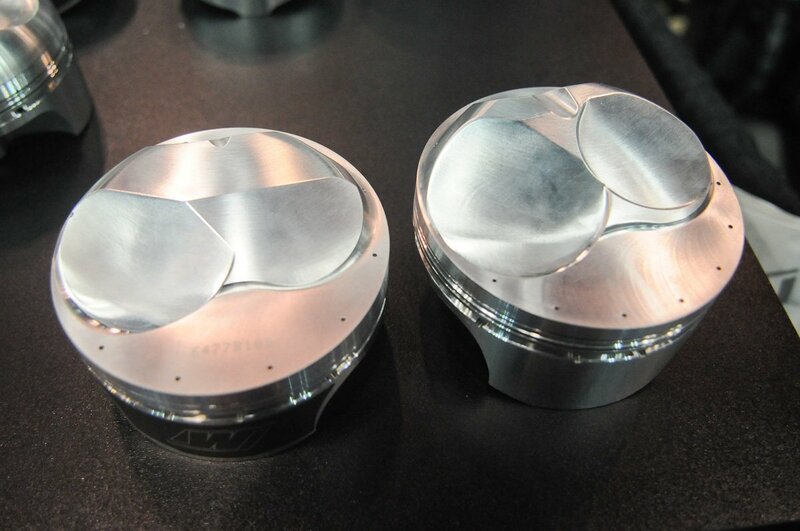 A set of custom JE pistons have been outfitted with a set of lateral gas ports to help with ring seal under the immense boost pressures this engine will see. Double pin oilers have also been machined into the pistons to ensure proper oiling at the 9,000-plus RPM level this engine will see on the track. A set of JE’s heavy-wall .927-inch DLC-coated wristpins are installed. LME has determined that for this application, running 10.0:1 compression is ideal when combined with the ProCharger supercharger that will be placed in front of the engine to provide the power enhancement. Piston rings are from Total Seal and consist of an M2 tool steel top ring, Advanced Profile napier-style second ring, and 3mm oil rings. The top ring uses .001-inch axial clearance and .008-inch back clearance, while the second ring is set at .0015-inch axial clearance and .005-inch back clearance to provide maximum sealing. On the top side of the engine, a set of six-bolt Edelbrock LS-R cylinder heads developed by Curtis Boggs at Race Flow Development are installed. The heads have been set to 52cc chambers using Boggs’ porting and machining skills, some of which we’ll discuss later in the article. The heads ride on a set of custom 4.160-inch bore dimension, six-bolt custom SCE Pro Copper head gaskets made specifically for our solid-deck engine. A set of Ferrea titanium intake valves and Pro Alloy exhaust valves control airflow, and are assisted by a full complement of PAC and Lunati valvetrain gear. A COMP Cams camshaft of undisclosed dimensions is also installed – hey, we have to have some secrets, right? 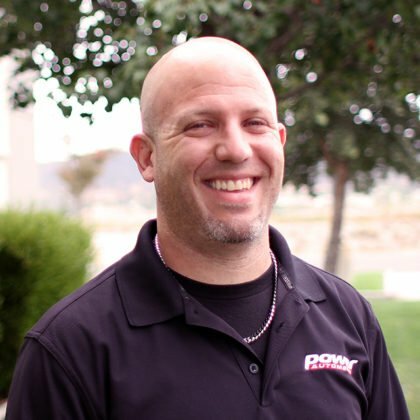 Curtis Boggs from Race Flow Development worked over our Edelbrock LS-R castings. Jesel .937-inch-body lifters ride in the lifter bores, and we also picked up a Jesel belt drive and belt drive distributor designed specifically for our LSX block. The company also got the call for a set of 1.8:1 ratio rocker arms with tool steel ball adjusters. The last part of the induction equation for this long-block comes in the form of a fully-ported Chevy Performance LSX-DR intake manifold, which was treated to the full makeover by Keith Wilson and the induction specialists at Wilson Manifolds. These are the parts used in the build, but you’re really here for the top ten tips – so let’s get to them! The LS engine platform, as designed by GM, has a large known issue with the oiling system consuming a lot of oil. In this particular engine, we have a dry sump oil pump and external tank and filter, which freed up the LME crew to make a number of modifications in the name of controlling oil flow. This LSX block uses an oil inlet fitting placed in the rear of the block. The circuit pulls the oil from the pan, through the scavenge section, then gets delivered to the tank. From the tank, the oil travels through the pressure section of the pump, then to the remote filter housing and finally enters the block via the fitting in the rear of the block. From the fitting, it goes straight to the main oil galley and pressurizes the crankshaft and rod bearings. “We make several modifications to direct the oil to the main and connecting rod bearings as quickly as possible. The LSX block has a priority main oiling circuit, but we take it the next step further to eliminate some 90-degree turns that the oil has to make. Fewer turns equals less restrictions – for every 90 degree turn you eliminate, an approximate 2-3 psi gain in oil pressure is realized,” says LME’s Bryan Neelen. “Since we are using the remote tank and dry sump, we’re eliminating the circuit where the oil would run through the factory oil filter feed and any potential restrictions that can occur here,” notes Neelen. The modifications performed by LME block off the factory oil galley that runs the length of the block; this is done by staking a plug into the front of the galley behind the belt drive, along with another staked plug that’s installed in the rear of the block just ahead of the oil inlet fitting. There are also .100-inch restrictors placed in the front of the oiling circuit behind the camshaft plate to restrict the oil flow to the lifters and pushrods; these restrictors ultimately reduce the gallon-per-minute oil consumption of the engine and decrease aeration while maintaining lubrication to the top end. The LME modifications eliminate eight 90-degree turns that the oil would make in a factory LS oiling system, and much greater control is gained. “The rule of thumb is to run the biggest pushrod you can fit in the motor. Typically the diameter of the pushrod tube relates to the spring pressure, RPM and expected cylinder pressures under various applications. Larger diameters are used for various racing applications, with a 7/16-inch heavy wall pushrod needed as a minimum for spring pressures greater than 1,000 pounds. 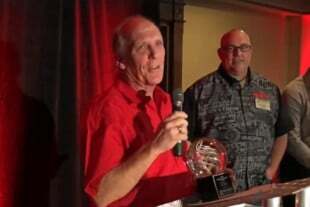 In a high horsepower application with power adders, cylinder pressure on the exhaust side can be greater than the spring load,” says TREND’s Steve Rhodey. This engine will see immense valve spring pressures; as a result the valvetrain needs to have pushrods that are capable of driving the rocker arms without flex. To that end, the TREND Performance pushrods are a whopping 9/16-inch diameter, built from .187-inch wall 4130 chromoly. Our pushrods use a bronze insert that provides excellent wear resistance. More importantly, matching the pushrod diameter to the spring pressure is a critical part of the component selection process. In order to allow the pushrods enough clearance, the cylinder heads needed to spend some time on the mill for machining. “We remove material to let the pushrod clear the cylinder head. With the 9/16-inch pushrods in this engine, extra clearance is required to allow them to operate properly. We’ve even used 3/4-inch pushrods on the intake side with these cylinder heads before; they need even more clearance,” says Neelen. The last thing you want is for a pushrod to touch the cylinder head and cause a valvetrain failure. The boost pressures that will be seen in this engine require the use of the mentioned SCE Pro Copper gaskets, complete with an O-ring fit into the engine block and receiver groove that’s machined into the cylinder head surface. This copper gasket works in conjunction with the sold-deck modifications LME performs, discussed in the next two tips. One thing that LME has found successful is to use 100 percent pure silicone to lay a super-thin coat onto the gasket. “It’s a matter of a little bit of experience in terms of applying, it but we’re only using a thin film – it has barely any thickness to it. It’s filling any imperfections in the deck or block surface,” says Neelen. Note the custom solid-deck head gasket. LME coats these in a thin film of pure silicone. In our application, the steel O-ring has been set into the deck of the block with a .014-inch protrusion, and there’s a .012-inch-deep receiver groove in the cylinder head. “Theoretically, the head should not touch the gasket, because there’s .002-inch interference there. It does touch it, because the gasket and O-ring crush into the receiver groove. The soft copper combined with the O-ring that sticks out of the block creates a positive lock into the groove on the cylinder head when you torque the cylinder head down,” says Neelen. The custom SCE head gaskets have been designed specifically for this solid-deck conversion. Once the heads are initially torqued on the engine stand, LME uses heat guns to put heat into the cylinder head, which allows the copper to get hot and lock in further, then they perform an initial retorque of the head while the engine’s still on the stand. It’s then fired on the dyno, run to full operating temperature, and cooled down to ambient temperature to torque the head’s down on the gaskets yet again. They also mark the stud and nut with a yellow paint pen to track movement of the fastener on the retorque process. Some applications require a second retorque to get everything locked down. The whole point of the fastener-torque and engine break-in process is to have the engine race ready for the customer prior to delivery, but these same steps should be taken by anyone building a serious LS race engine. LME also performed a solid-deck modification on the engine, fitting custom-machined plugs into CNC-machined recesses in the heads, which are then milled down to the block’s deck height to seal off the water passages down to only what’s required for the engine to stay cool – and in the process, building in substantial strength to the foundation. “One of the best things that you can do for any LS-series block is to use this solid-deck modification, to strengthen up the block. The water jacket shapes are cast, and not uniform. We machine each jacket – there are four different shapes – to its respective shape, about half an inch deep. We then use the custom-machined steel slugs, which use a .001-inch press fit around the entire shape, and press them into the block before using a shell mill to machine off the excess, and then a final surfacing of the block” says Neelen. The solid deck modification involves clearancing the factory water jacket holes to make them uniform, then a set of custom plugs is installed. Finally, they are machined down to flatten the deck once again. Of course we wondered about bore distortion with the installation of these pieces, but he assured us that this process is done before the bore is ever touched in the block. The distortion is approximately .005-inch, which is all corrected upon the final bore to 4.120-inch and hone, which finishes the bore to the final dimension of 4.125-inch. This process removes the large factory water jacket holes and greatly reduces the chance of pressurizing the coolant system when under massive amounts of boost. The smaller holes that they final-machine into the slugs provide enough coolant flow for a racing application. Using this process has virtually eliminated distortion of the water jacket under boost. Our SCE gaskets are cut to match this cooling system pattern. A look at the final-machined deck surface, Note the coolant holes that have been drilled into each deck plug. Working hand in hand with the block deck modifications are the cylinder head modifications that LME recommends. Rather than closing the water jackets in the deck of the cylinder head with a steel plug, the instead weld up the coolant holes to match the block’s dimensions, then drill the same hole to match the block and the head gasket. “The head gasket meters the water, and we’re drilling the hole the same size as what’s in the gasket, so you’re not reducing the coolant flow. This doesn’t make the engine run hot; it strengthens the block and heads with no downside,” Neelen explains. The coolant holes in the cylinder heads are also closed up with a weld process, then small holes are drilled to match those in the block's deck surface. Perhaps you’re sensing a theme here – working over the cooling system is a big part of the modifications that LME performs to their race engines. The cylinder heads we’re using, Edelbrock’s LS-R castings, have a provision to cool the hot side of each combustion chamber (the exhaust side), and LME takes full advantage of that capability. These bosses are drilled and tapped for external coolant flow. “We drill and tap these holes to get more coolant flow around the back side of the chamber. This is where the head gasket on the deck surface will typically blow first – on the exhaust side in the center of the cylinder. The LSX block has two extra cylinder head bolts, one on the exhaust side and one on the intake side, because that’s where the block-to-head clamping weak points were. Cooling the block down in this area reduces the chances of head gasket failure,” he notes. One purpose for putting a bronze bushing into each lifter bore is to provide better lubrication to the lifters themselves. The bronze bushing LME installs aids this lubricity much better than the iron block material. There’s another advantage, and that’s to ensure that the lifter location is in the proper place according to the factory blueprint in order to provide proper valvetrain geometry. “We’re trying to achieve two things here. We precisely locate the centerline of the lifter bore where we want it. We use the block schematic as part of the blueprinting process, go to those specific coordinates, and punch the holes so they are over the cam lobe in the correct location,” says Neelen. Left - the bushing during installation. Right - Bushings installed and lifters in place. At the same time, they are increasing the hole dimension; factory lifters use a .842-inch dimension, and the new lifters are .937-inch diameter. 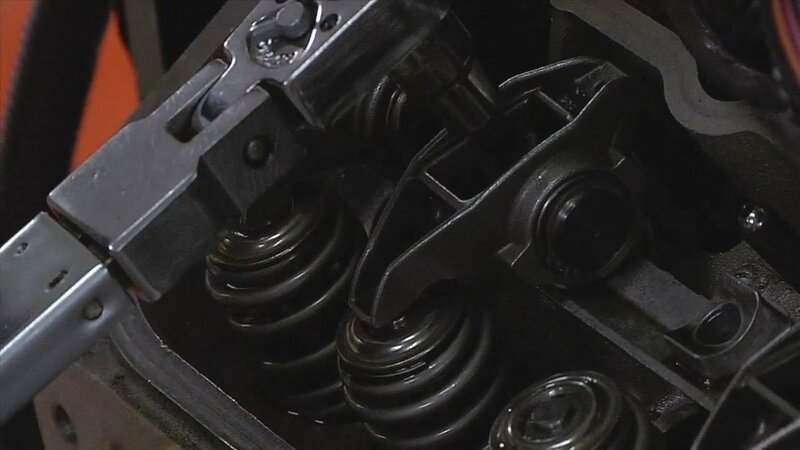 The larger-diameter lifter handles the increased spring pressure of this engine much better than the factory-sized lifter. The block is machined in a four-axis CNC mounted to a rotary table, which allows the block to be moved around 360 degrees. The lifter bores are positioned at the proper angle, cut with a carbide end mill to rough-bore the holes, and then they are finished to provide a press-fit for the lifter bushing. The tool is indexed to be parallel with the centerline of the crankshaft, which ensures that the lifter keys are in the correct location in relation to the cam lobes. Reducing the quench area slows down the rate of burn – critical in boosted engines. As the modifications to the combustion chambers were performed by Race Flow Development, we headed straight to the source to find out the reasoning for softening the chambers in this particular engine. 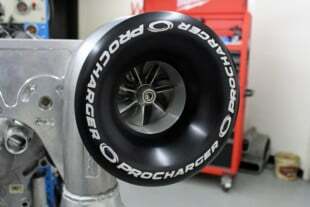 “There are several variations of chamber softening. On the LS-R, it’s done on the CNC machine that I refer to as a conical cut, or a dish cut. It starts from .050-inch to .100-inch inside the bore, and gets deeper and progresses toward the center of the chamber. The angle is varied, it could be five degrees, or seven degrees or more, and depends on the application,” says RFD’s Curtis Boggs. There is one main reason for performing this modification – to slow down the rate of mixture burn in the chamber. “Poweradder engines have a problem with pre-ignition, or detonation. The primary place where the detonation starts is in the quench area. In a naturally aspirated engine, the quench area accelerates the flame front and helps atomize fuel in the chamber and push everything towards the center of the chamber. In a poweradder engine, that’s a disadvantage. 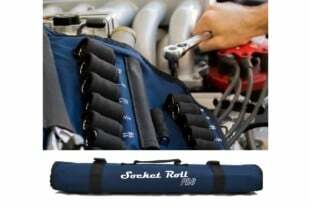 You’re stuffing so much more fuel and air into the chamber, or adding so much nitrous in those combinations, it will make the engine very detonation-prone. By softening the chamber you’re trying to slow down the flame front and reduce the chance for detonation,” he explains. Another angle of the softened chamber. Galling can be an issue between the camshaft drive hub and the face of the camshaft thrust plate. LME performs a Torrington bearing modification to the hub to prevent this potential problem. It’s a simple modification that requires them to turn down the drive hub the thickness of the Torrington roller bearing, press-fit the bearing, then install the hub. Camshaft endplay is .004-inch. “There’s some deflection in the thrust plate that we’ve seen, which doesn’t help the situation. The belt drive is supplied with a bronze bushing; we take it to the next level by eliminating the bronze bushing and machining the step to use the bearing instead,” says Neelen. Left - Jesel supplies the belt drive with the bronze bushing, seen at bottom. LME takes this one step further by modifying the camshaft hub with the Torrington bearing seen at right. Right - Checking the camshaft for endplay at final installation. The last of our tips is another simple one that pays big dividends while the engine is in operation. LME puts a simple groove into the very top of the thrust bearing to provide better oiling to the back of the thrust bearing and promote longer life. Left - An unmodified bearing shell on top, with the modified shell on the bottom. Right - The modified thrust bearing in place. “All we’re doing is making a little channel to allow the oil to lubricate the thrust bearing. We used to burn up a lot of thrust bearings that we learned was from a lack of oil. The thrust face surface finish of the crankshaft should be as smooth as possible – as close to 2Ra or better and should be in a circular pattern. That has a lot to do with engines wiping the thrust out of them, if the finish isn’t correct,” says Neelen. 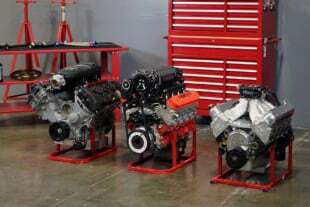 With the assistance of LME and RFD, we hope we’ve been able to provide the pertinent information explained in a way that makes it easy to understand, so that you can follow along to ensure the success of your next LSX engine build. 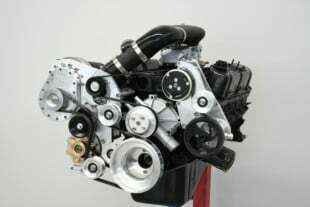 This guide is not the be-all, end-all of LS race engine building, rather, its intent is to be a helpful guide when you’re building an LS race engine of your own. These ten tips should be performed if at all possible in order to maximize performance and minimize the potential for issues on the track. LME spent in excess of 100 hours building this engine and getting it dialed in; much of that time was spent performing the operations described here to ensure the longevity of the engine.